WE BELIEVE THAT PEDAGOGICAL AND EDUCATIONAL ASPECTS ARE FUNDAMENTAL. OUR PROJECT AIMS TO BECOME AN EDUCATIONAL AND CULTURAL BENCHMARK WITH A SEAL OF QUALITY THAT IDENTIFIES IT. We present a variety of learning activities, mainly aimed at fostering respect for cultural heritage: whether historical, archaeological, natural or intangible, where the archaeological site and its environment are the natural habitat to achieve that goal. The Guarrazar multidisciplinary team consists of qualiﬁed instructors, archaeologists and other professionals with proven experience in the teaching and learning activities offered. They are designed for primary school pupils. Optionally and in consensus with each educational centre, we can implement similar activities adapted as necessary for infant, primary and secondary education students. Pedagogy specialists argue that the best way to learn is by building knowledge, attitudes and values based on fun individual and group experiences, but at the same time didactically signiﬁcant ones, and adapted to each school year. Our methodology seeks to integrate theory and practice, and to promote a traineeʼs role (for instance, producing objects representative of a given period of time, learning their meaning and developing their autonomous and cooperative competencies). EThe content of different activities is closely related to the concepts of natural and cultural heritage, Visigoth culture and history, with Archaeology as a method of search and interpretation, important items in its historical-cultural context, etc., all framed within the Visigoth archaeological site of Guarrazar and information held in it. We also consider decisive for the preservation of our rich historical and natural heritage, to promote attitudes and values of respect, admiration and responsibility in children as its future guardians and protectors. 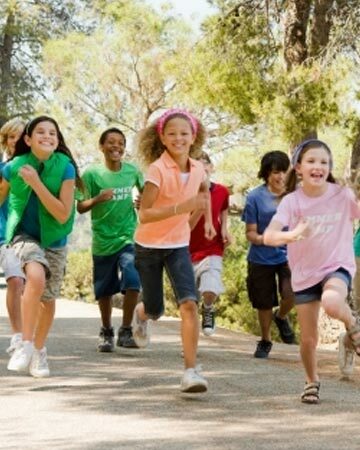 Any activity that we offer are engaging and internalized in a play-oriented way. 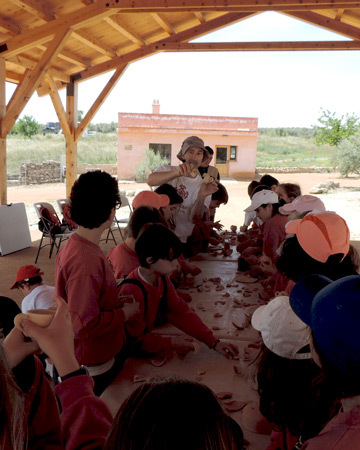 Although “Learning in Guarrazar” activities have been designed to be carried out at the premises of the archaeological site, our multidisciplinary team can adapt them to school centre, in case of teachers requiring so. Welcome students and teachers at the site receiving point. Presentation of Guarrazar team involved in activities. Brief explanation of code of conduct and site security plan. The tour starts with an introduction on the archaeological site and its natural and historical context, with the help of panels showing pictures of excavations and ideal reconstructions, also containing maps of the area, photographs of the treasure and other pictures that help to understand the meaning and the value. Then, the route begins with a walk through the different spaces of Guarrazar in order to understand, by means of the explanations given by the archaeologist and Guarrazar project manager, how the treasure was discovered and what has become of it since its discovery in 1858 up to the present. Futhermore, what the archaeological site is like, its different parts, the meaning of the structures being uncovered and an approach to Visigothic lifestyle and culture, using the archaeological remains and its natural environment as a guide. All the way through the site, participation and interaction between pupils and the archaeologist are encouraged in an atmosphere that is propitious for reﬂection and questioning of different topics that are being dealt with. At the end of his visit, all doubts or questions will be brought together under the porch. All the explanations are tailored to every school level. Depending on the number of students, time available and schoolʼs goals, some of the workshops offered and focused on Guarrazar site environmental, historical and archaeological context will be undertaken. End of activities and departure. Although most activities are conducted at covered spaces, it is convenient that both children clothing and footwear meet weather forecasts for the activities to be performed. Certainly, this activity is the main source of knowledge and the main experience for students. It gives them occasion to appreciate the richness of the archaeological heritage in the area, while allowing them to discover the history. Throughout the visit, an overview of archaeological remains and its importance from a historical point of view is offered, while stressing characteristics of the natural environment which turned out to be crucial for our ancestors to choose it as human habitat, from Prehistory until the Middle Ages. Fostering respect and appreciation for archaeological and environmental heritage. To understand the historical relevance of Guarrazar archaeological site. A deeper knowledge and understanding of Visigoth culture and Guarrazarʼs contribution to the Spanish history. 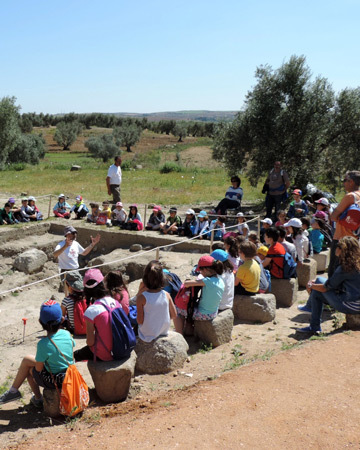 Understand an archaeological site can beneﬁt the childrenʼs understanding of History. Becoming familiarized with the concepts of historical, cultural, archaeological and environmental heritage. To learn more about Visigoth culture from Guarrazar. 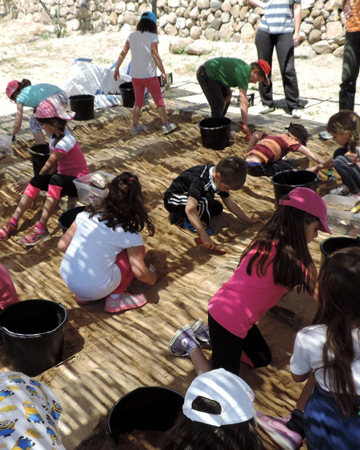 This workshop recreates an archaeological excavation on a small scale (30 m2) for the purpose of enabling students to experience professional archaeologistsʼs job. It includes: the excavation itself, sheet drafting on a basic level, collection of archaeological remains, etc., as well as the opportunity to reﬂect on the passage of time and the succession of cultures in the broadest sense. To learn through experience, the basic scientiﬁc methodology applied in an archaeological excavation. To differentiate between structures, identifying materials and the most common objects in an archaeological excavation. Reﬂecting on the relation between society and the environment around it and drawing conclusions from the excavation in Guarrazar. Shovels, brushes, buckets, excavation sheets, pouches for materials, labels, pencils and erasers. This workshop intends for students to become aware of activities carried out by professional archaeologists based on the varied information provided by excavation. For instance, cleaning and classiﬁcation of the extracted archaeological materials: ceramics, bones, stones, etc. Draw each one manually. The basic interpretation of the plans outlined during excavation, certain materialsʼ features and their cultural assignment, etc. To understand the importance of the methods of data collection from an excavation. To learn some of the main characteristics of the materials found and their basic cultural cataloging. Drawing of simple ceramic materials and attempting to reconstruct vessel fragments. Designing simple drawings and reconstructing pieces in order to differentiate between basic forms and to reﬂect on the value of material extracted through archaeological methodology and other means. Replicas of archaeological materials similar to those obtained in Guarrazar. Drawing materials: pencil and eraser. Material data sheets. Material to clean and classify archaeological materials, pouches and labels to store clean material. Through this workshop, students are able to learn to understand the importance of water as a source of life and know the many varieties of animals and plants that exist thanks to Guarrazar permanent spring. To appreciate waterʼs role as a key environmental factor for the settlement of Guarrazar. Learning the fundamentals of the life cycle of amphibians living in the pond (frogs, newts and toads). 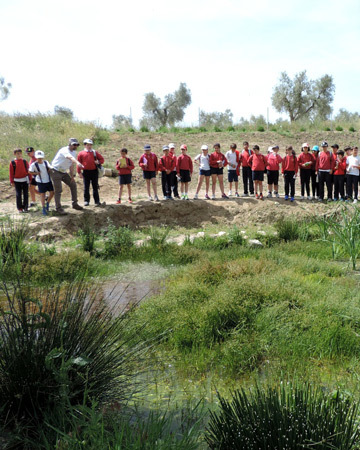 To learn where dragonﬂies live in the pond and how they feed in every season of the year. To identify plants and animals in the pond, from images. This is designed to encourage co-operative values, at the same time as the gymkhana participants will reinforce their learning about the archaeological site. Therefore, students will split into groups that will compete against each other to show the best acquired knowledge before a jury at the end of the tour; it will demonstrate their depth of understanding, cooperation and communication skills. To show that knowledge acquired throughout the visit has been adequately learned. To discuss within each group and to make decisions before every challenge. To overcome problems encountered in the visit. To enjoy the site as well as assimilating the need to preserve it for future generations. Complete the proposed itinerary, to meet cooperatively the challenges posed, show leadership and communication skills. Road map and evaluation of every challenge posed, meeting requirements to undertake them. In addition to these workshops there is the possibility of organizing other ones related to creative arts (ceramics and casting) or horticulture. Our team can also come to the educational centre to give talks or to hold workshops. All activities at Guarrazar, have been prepared and are carried out by a team of archaeologists, biologists and other graduate professionals with proven experience in teaching/learning activities. Besides archaeological areas, Guarrazar has an interpretation centre located in an old restored tool shed, toilets and a multifunctional porch over 120 square meters, made of wood for a better integration with the environment. Both facilities and archaeological excavation areas have been adapted to be even wheelchair accessible.